My teacher, the 'Pilates Elder' Mary Bowen, first introduced me to Pilates and to the world of intelligent fitness. She continues to be an inspiration. Thank you Mary. For my interview with her click here. I just love to teach - something about it deeply satisfies. And I love helping people move better. 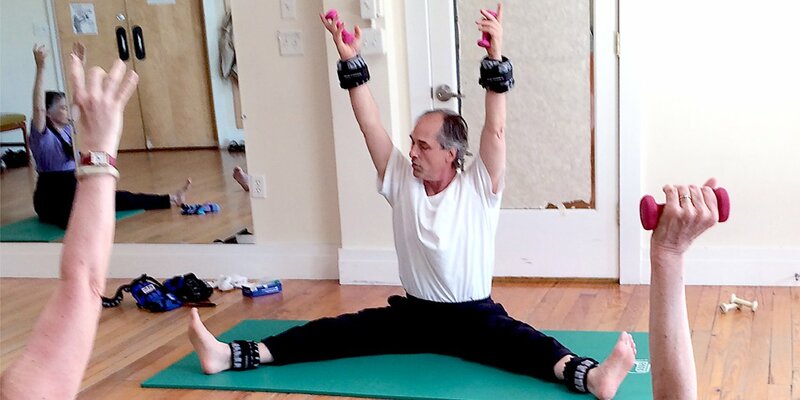 I particularly enjoy knowing that I'm teaching the healthiest exercise method on the planet! You see, I'm one of those people that simply must exercise several times a day every day. I've been doing this as long as I can remember! It calms me, clears my head, lifts my spirits, keeps me healthy and now as I get older, is the best antidote for daily joint pain and stiffness. I've tried just about every kind of exercise from boxing to modern dance; wrestling to yoga. Pilates is not the only thing I do, but it's my favorite and I couldn't live without it. My Pilates experience has been full of adventure and fortune right from the very beginning with my teacher and mentor, the 'Pilates Elder' Mary Bowen. So I created this website to share everything I've learned. I want people to know just how special Pilates is - why dynamic stretching is so effective, why eccentric contraction is so beneficial, why the body needs 3 different kinds of exercise, and why Pilates is one of the rare methods that does it all! I want to share insights about breathing, tell you about a new prop I'm wild about, and shown you videos I find extraordinary. It all began nearly 40 years ago with a serious back injury. Facing surgery and a premature end to a serious interest in dancing and acting, a strange and forceful character suddenly entered my life, the ‘Pilates Elder’ Mary Bowen. She suggested that Pilates might help. I'd never heard of it and had nothing to lose, so I tryed it. The results astounded me! I not only avoided surgery and medication, but quickly returned to acting and dancing with more strength and confidence than ever before. Pilates amazed me. For most people a back problem is never cured. Even with successful surgery there are always activities to avoid and discomfort to deal with. Pilates enabled me to manage daily morning backache and stiffness without even aspirin with just a couple simple exercises daily. Best of all, I've never had to limit my physical activity or view myself as a person with a back problem. After a couple years of training with Mary, I began to teach. I noticed how complicated Pilates instruction often is - an occupational hazard for every Pilates teacher, because it's so rich and deep you want to share it all! So I set off on a journey to create instruction that was as clear and simple as Joseph Pilates originally taught. I explored each exercise and stripped it of everything but its essentials. I studied film footage of Joseph Pilates. I tested my new emerging instruction on my students. After much refinement I finally discovered a way - featured in my free lessons and in my ebooks and videos - that makes Pilates quick, easy and fun to learn. It’s been many years in the making and a dream come true. My journey doesn't end there. 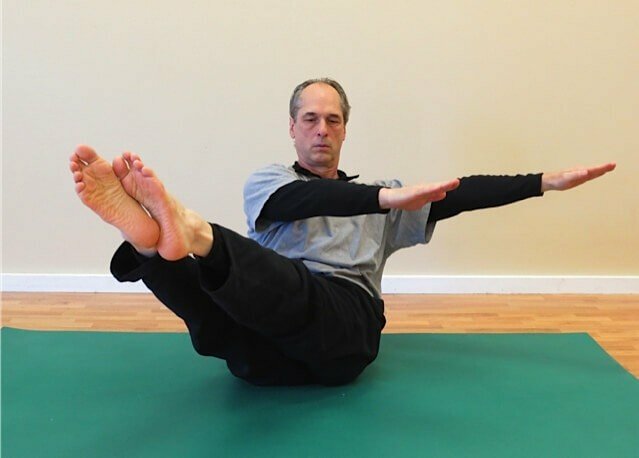 After a couple decades of teaching I decided to enter the world of the internet where I was surprised to find very few comprehensive Pilates websites - I list the exceptions in the sidebar on my homepage. Not only that, free and paid lessons appeared everywhere with little mention of instructor experience or credentials, so crucial for getting results and avoiding injuries. Even Wikipedia was lacking. So I decided to create this site to change all that! I also began to call for simplicity with articles published by major pilates blogs, and I continue to gently but persistently repeat my message. I'm pleased to say that I haven't met anyone yet who disagrees. The time for a new way of teaching has come, Pilates instruction the way it was originally taught. I’ve taught a a wide variety of age groups and fitness levels including people with mental and physical challenges. My specialty is the original - some say 'classic' - Pilates mat routine to which I add a rigorous and athletic style just as Joe Pilates taught, with a great love for all the variations and fusions. Pilates is full of change and vitality and debate and I love it all! Most of all I love the freedom from equipment and a gym - Pilates ma exercises alow you to do Pilates anytime and anywhere. Join me on this adventure and share your experiences along the way. Email me anytime at Bob@PilatesLessons.org or contribute to the forum so others can join the discussion. Also join our lively community on Facebook which is now one of the most popular Facebook Pages about Pilates. My other adventures include co-owning fitness facilities, retreating to monasteries, a brief time as a professional modern dancer, repairing sculpture for artists and museums, principle actor in the science fiction opera Valis, interviewing a living saint Jean Vanier, publishing research on 'social integration,' helping spearhead Shared Living, and creating 'social enterprises' for people with disabilities. You can also find me on Pinterest, Facebook, Youtube, Twitter, Linkedin and Google+. The mission of this website is to provide the highest quality Pilates mat instruction and the most comprehensive information about Pilates so that anyone who visits finds exactly what they're looking for - a convenient, one-stop web experience. Additionally, this site is designed to complement and not replace any advice or information from a health care professional. Many thanks to Carey Baker of Midnightson Designs for filming, editing and creative vibes. Special thanks also to Kris Badertscher of K Best Productions for additional filming, Jim Madden of Asterisk (Florence, MA) for graphic design, Janice Beetle of Beetle Press for text editing, Martha Belden and Catherine Hannum for proofreading, and to all my students for inspiration and encouragement all along the way. Special thanks to I.C.Rapoport for permission to use his extraordinary photos of Joseph Pilates. A very special thanks goes to my soul mate Bonnie for everything in between! Funding for this website does not include contributions from medical, pharmaceutical, political or other financial resources other than my own. I receive a commission for sales of products that appear on this site. A portion of the income generated by this website is annually donated to the Hope Flowers Schoolin the West Bank - a great light of peace and hope in a dark part of our world.